Three groups of sunspots emerged this week. This image was taking by the orbiting SOHO spacecraft. The groups of spots are all growing and capable of producing flares. However, their magnetic polarity pegs them to the last solar cycle, not this one. Some media reports and headlines recently suggested that thesun's present lack of activity could lead to another Little Ice Age, but manysolar scientists say that's unlikely. Yes, the sun hasbeen quiet lately, with very little magnetic activity on its surface;strong activity would be signified by darkpatches called sunspots. Until recently, this was to be expected: The sungoes through roughly 11-year cycles, and 2008 was a predicted trough ofactivity. But so far, the sun hasn't seemed to pickup in activity as predicted ? 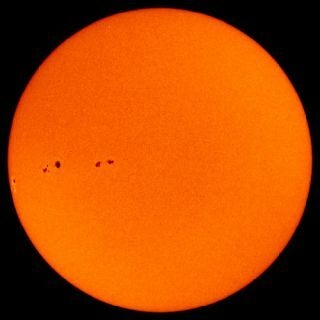 sunspots were seen on only 12 of the first 90days in 2009. "This reluctance of the new cycle to start has me andothers wondering if we might be headedtoward a grand minimum where the sun stops producing spots fordecades," said NASA solar physicist David Hathaway. Still, Hathaway does not think this is going to lead to majorglobal cooling, or anything that will significantly alter the trend towardglobal warming. The previous grand minimum, called the Maunder Minimum,occurred between 1645 and 1715. The lull fell during a longer range (from aboutthe 16th century to the mid-19th century) when certain areas on Earthexperienced a dip in temperatures that became known as the "Little IceAge." This connection has prompted some to say we could be headingtoward another mini Ice Age. But the science of all this ? how and how muchchanges in solar activity affect Earth's temperature ? remain largelyunresolved. And anyway, Earth's climate has biggerfish to fry these days, scientists say. The last Little Ice Age occurredbefore the Industrial Revolution, and may also have been influenced by volcanoes,which tend to lower temperatures. This time around, Earth's atmosphere is packed with carbondioxide and greenhouse gases produced by human activities. The warming effectsof these heat-trapping gases will probably dwarf any slight cooling that occursbecause of a lull in the solar cycle. "I doubt a Little Ice Age given that we now have nearlytwice as much carbon dioxide in the atmosphere than we did 200 years ago,"Hathaway told SPACE.com. "I think that plays a larger role thanwhat the sun does." Judith Lean, a solar physicist at the U.S. Naval ResearchLaboratory in Washington, D.C., agreed. Even if we do enter a grand minimum ofsolar activity, it would likely cool the atmosphere only slightly, she said. "It's possible that there would be some regions thatcool more, but globally we wouldn?t expect cooling of more than a few tenths ofa degree," Lean said. "And that would be an order of magnitude lessthan the effects we expect because of global warming, where we're talking aboutwarming of 1 to 4 degrees." In general, the connection between solar activity andtemperatures on Earth is not firmly established. There is good evidence thatsolar activity does affect climate: When the sun is more active, surface temperatureson Earth tend to be slightly warmer, and when the sun is inactive, Earth tendsto be cooler. However, the strength of this effect and the reasons for itare not well understood. The explanation is not simply that the sun is brighterduring periods of high activity and cooler when the sun is quiet. It's more likely that changes in solar activity releasedifferent kinds of energetic particles toward the Earth, which then influencethe chemistry of Earth's atmosphere and affect the climate. With certainty,scientists know that when the sun is active, it can kick up space stormscapable of knocking out satellites and even disabling power grids on Earth. Infact some researchers think the next predicted solar activity peak, in 2012,could be one of the strongestever, potentially kicking up storms that could bring modern technology toits knees. So no matter what the sun does over the next few years, itwill be very interesting to scientists. "The solar community is very excited about the sun'sbehavior right now," Lean said in a phone interview. "It's afascinating time to be working in this area."